Hyperprolactinaemia is a common cause of infertility in women. The most common cause for hyperprolactinaemia (after excluding ingestion of medications which elevate prolactin) is a pituitary tumour. These tumours can either be small (diameter less than 10 mm) = microadenomas, or, if greater than 10 mm, are termed macroprolacti-nomas. Although this distinction is arbitrary, it is often useful in predicting the outcome of transsphenoidal surgery, although the basal serum prolactin is a better predictor. Irrespective of the size of the tumour or the pretreatment prolactin level, medical treatment with dopamine agonist drugs (e.g. 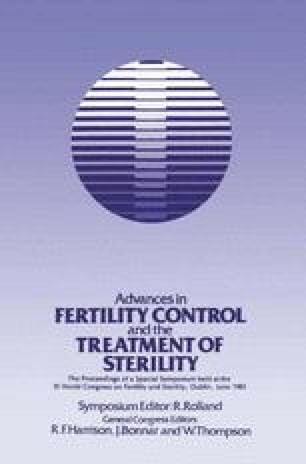 bromocriptine, lisuride and pergolide) is effective in >80% of cases in lowering prolactin levels and in restoring gonadal function. The large tumours undergo volume reduction under this form of therapy. The potential problem of tumour expansion during pregnancy which is a function of the pre-existing tumour is reviewed. This risk appears extremely small in microadenomas but may be clinically significant in 10–25% of macroadenoma patients. The dilemmas of the management of this controversial problem are discussed.